Here is a free Network Merchants module that works with Prestashop versions 1.4x and, 1.5x, and 1.6 alpha. The module is based off of the Prestashop Authorize.net module which is in-use in thousands of stores world wide. 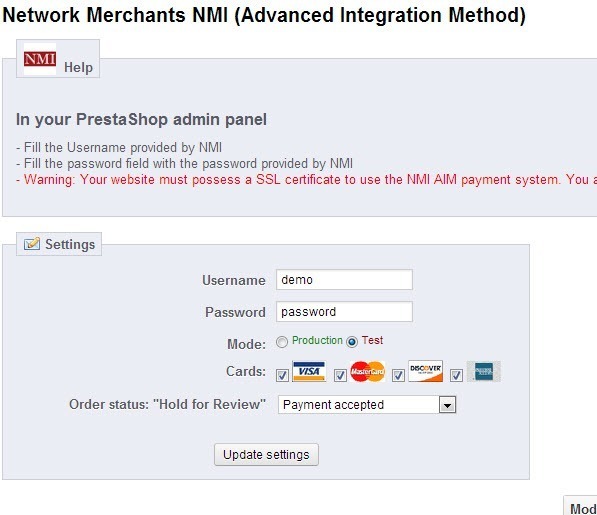 This module will allow your PrestaShop site to accept payments through the NMI payment Gateway. This module requires you to have a SSL certificate on your site and SSL enabled in PrestaShop.